Sidney was born in Newbury on 21 October 1891, the son of Charles Brooks and his wife Ellen (Sarah Ellen Smith). He was the second of their six children. Charles was a bricklayer's labourer - at a time when Newbury was expanding rapidly he should have found plenty of work. It was a building boom that benefitted the Brooks family, in 1891 they were living in a small cottage in King's Road (now King's Road West), in 1911 they were in Essex Place, an older and even smaller cottage behind 131 Bartholomew Street (now buried under the Kennet Centre). However, by 1916 they were in much more modern accomodation at 12 Adey's Buildings (now Adey's Close) in an area that was covered by workers' terraced cottages in the late C19th, early C20th. Sidney would have been educated at one of the local schools until he was aged 12 when he would be expected to find employment and contribute to the family budget. At the time of his enlistment in the Royal Navy on 21 October 1909, shortly before his eighteenth birthday, he was working as a grocer's assistant. Other information on his service record gives a picture of the young man; short (5ft 4½in - having grown an inch after enlistment) with brown or light brown hair, grey eyes and a fresh complexion. His life in the navy also seems to have affected his appearance as a number of tattoos are recorded. 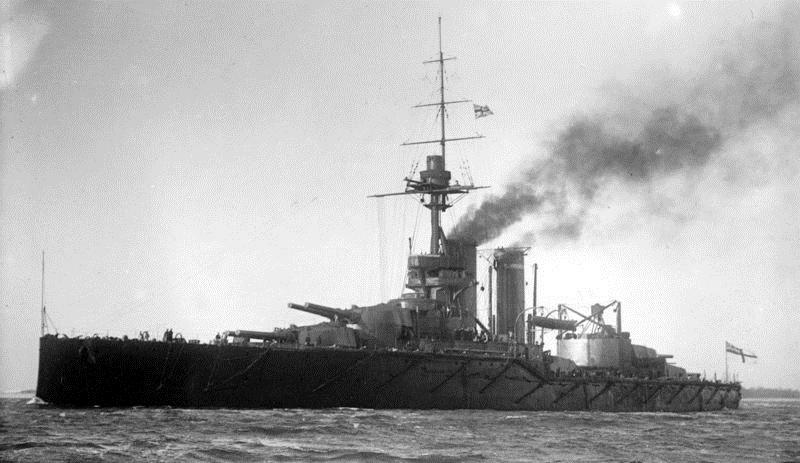 When war was declared in 1914 Sidney was serving on board one of the Royal Navy's most modern battleships, HMS Audacious, launched in 1912. 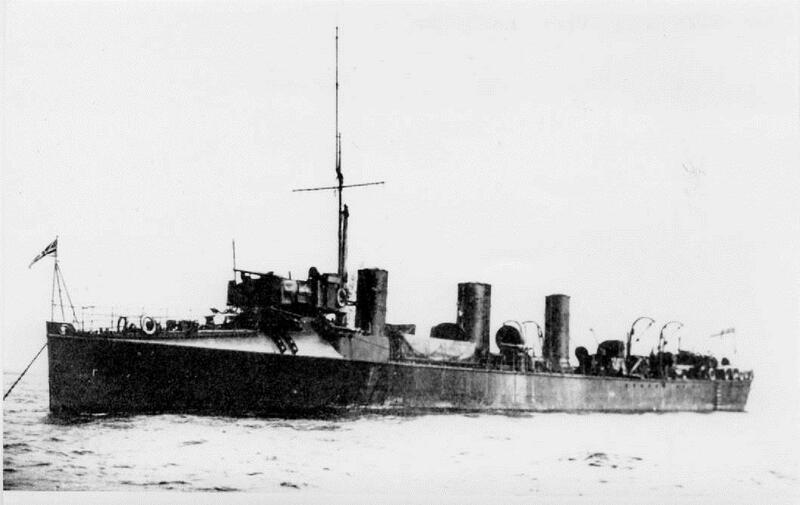 Audacious was part of the 2nd Battle Squadron of the Grand Fleet; on 27 October 1914 she left her anchorage in Lough Swilly, Northern Ireland with the rest of the squadron to take part in gunnery exercises. At 08:45 Audacious struck a German mine off Tory Island. Most of the crew were taken aboard RMS Olympic (a sister ship of the Titanic) a skelton crew remaining on board in an attempt to save the ship by towing her back to shore. The attempt was doomed to failure and the remnant of the crew, together with the Captain, were taken off at 19:15. As the Audacious sank she first turned turtle, at which point a huge explosion tore her apart - causing the only casualty of the sinking as a piece of armour plate fell on and killed a sailor 800 yards away on HMS Liverpool. Sidney was subsquently posted to HMS Queen Elizabeth, another battleship, but fell ill and missed her departure for the Dardenelles where she took part in the Gallipoli campaign. Around this time Sidney attended gunnery school. His next ship was a big change from the battleships he had served on to date; HMS Racehorse was a destroyer in the Dover Patrol, carrying out excort and anti-submarine duties in and around the Dover Straits. Perhaps it was unfamiliarity with smaller ships that led to Sidney's fatal mistake on the night of 9 December 1915 when he was lost overboard. News has been received by Mr and Mrs Charles Brooks, of York-road, Newbury, that their son, Sidney James, serving as seaman gunner on HMS Racehorse, was swept away during a heavy sea on the night of December 9th. There is little hope of his having been saved, and the Admiralty have officially notified his disappearance. He was 24 years of age, and hand been in the Navy for seven years. He had passed through the gunnery school, and there was every prospect of a promising career. He was originally on HMS Audacious, and subsequently HMS Queen Elizabeth. In addition to the grief of losing this son, the parents have another one at home, Pte Herbert Charles, of the 5th Royal Berks, who received five severe wounds in action in France. He has been under treatment in hospital at Brockenhurst, and is now on sick leave, but is far from complete recovery. The funeral of Seaman Gunner Brooks, of HMS destroyer Racehorse, took place on Thursday last at Dover. He had been washed overboard on December 9th, and his body was not discovered until last week. His father and mother, Mr and Mrs Charles Brooks, of Adey’s buildings, and his sister were present at the funeral, when he was laid to rest with full naval honours. He had been in the Navy eight years, and has served on the Audacious, St Vincent and Queen Elizabeth, but was taken ill just before the last ship’s trip to the Dardanelles. He had got on well, and was on the list for promotion when the accident took place by which he lost his life. INQUEST ON TWO NAVAL MEN. An inquest was held at the Esplanade Hotel on Monday afternoon, by the Borough Coroner (Mr. S. Payn) to ascertain the circumstances under which two more Naval men were drowned in the docks. Mr. H. Hentall was chosen foreman ot the jury, and at the Mortuary they viewed the bodies of Sydney John Brooks, of one of H.M. torpedo boat destroyers, and that of John Kemp, a greaser on a mine-sweeper. Gunner T. E. Linnington, of one of H.M. torpedo boat destroyers, identified the deceased Brooks as Sydney (sic) John Brooks, A.B., aged about 24 years. The deceased had not been seen since 10.30 p.m. on December 9th, when witness was officer in command of the watch when the torpedo boat destroyer was lying in the Granville Dock. Witness had heard that the deceased came from his mess and went to the upper deck. He was sober, being one of the watch aboard, and not allowed on shore at all. There were berthing rails all round the vessel, and it was quite safe. Brooks's cap was found floating soon after 11 p.m. between their vessel and another one. When it was found witness mustered all hands and, finding Brooks missing, got drags out to search for him, but without result. John William Cook, A.B. on one H M. ships lying in the Granville Dock, said that he saw the body of Brooks in the water in the dock at 8.10 a.m. on Saturday. He reported it to a constable, and assisted him to lift the body out, and it was taken to the Mortuary. The body was found in the same place as the torpedo boat destroyer to which he belonged had lain. Police-constable Kemp, to whom the last witness reported the discovery of the body, said that it was floating opposite the "George" Corner, and by means of a boat, with the witness Cook's assistance, it was hooked out with a boat hook. The deceased was fully dressed and in sea boots. Twopence in bronze, and a letter, addressed to him from Ealing., "To my dear brother," were found. His shirt was marked "S. Brook." He was tattooed with a snake and a bird on the left forearm; and on the right arm, anchor, star, dancing (illegible), a woman, a butterfly, and a bunch of flowers with the name "Elsie" thereon. His height was 5ft. 7ins., and he was clean shaven. Dr. Baird said that the deceased's body was in too decomposed a condition on Saturday to be able to tell anything except that death was (illegible) due to drowning. In reply to the Coroner, Gunner Linnington said that he should say that, without doubt, the deceased could swim, as they were very strict in the Service on that point. The Coroner said that was all the evidence, and apparently the only one who knew anything more about the case was the poor fellow himself. How he got overboard was a mystery. A verdict of found drowned was returned. The inquest paints a very different picture to the Newbury Weekly News reports - swept overboard in heavy seas is very different to falling from a ship in dock! Did he fall off the ship while drunk (despite the naval witnesss assertion that he was sober)? Did he simply trip and fall (despite the berthing rails rigged around the ship to prevent such accidents resulting in a man overboard)? Or did he jump off deliberately? Jumping off a ship in dock would be a strange way to commit sucide (the middle of the Channel would be a more obvious spot) - but it is also an extreme way to go ashore for a beer! As the coroner said - the circumstances of his entering the water remain a mystery. Once in he would have the cold December water to deal with, even a strong swimmer would not survive for long. There was another inquest on the same day, into the very similar death of John H Clark, which reads more like an accidental death, but the same lack of witnesses led to the same uncertain verdict. Sidney was buried in St James' Cemetery, Dover; his name is remembered on Tablet 13 of the Newbury Town War Memorial as well as the Parish Memorial and Roll of Honour in St Nicolas' Church. 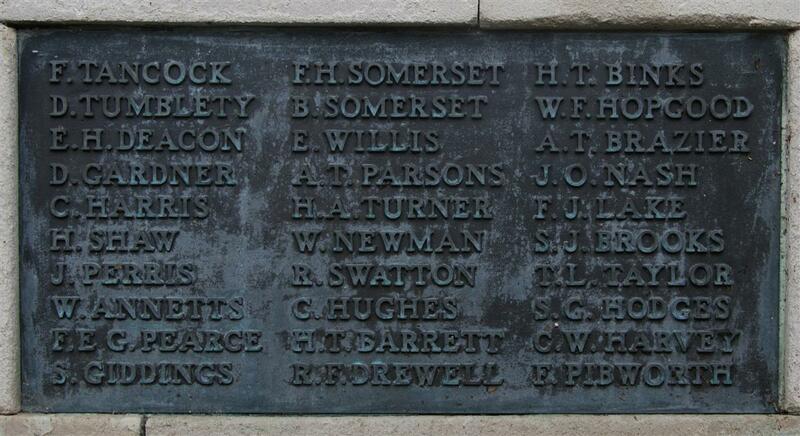 Pte Herbert Charles Brooks, of the Royal Berks, is again reported wounded. Thirteen months ago he was disabled for some months by wounds, and had only returned to duty about seven weeks. The parents, Mr and Mrs Brooks, of Adey’s-buildings, lost a son in the Royal Navy. Herbert was evidently a resilient chap and survived being wonded no less than four times in total. He married Ellen Beasley in 1918 and lived until the age of 78..
Mr and Mrs C Brooks, of 12, Adey’s-buildings, Stroud Green, contributed three sons to the Great War, and have lost two, while one has been wounded four times. Sidney James was wrecked on the “Audacious” and was transferred to “Queen Elizabeth,” thence to the “Racehourse,” from which he lost his life in the Dover Straits, on December 9th, 1915. Ernest Walter, a private in the 7th Northamptons, who joined in April 1917, had been in France six months, is now reported killed. Herbert Charles was wounded four times.